El Capricho Extremeno is a small tostada shop located in the La Latina neighborhood of the Madrid center. Tostadas are simple: a large piece of bread with different ingredients on top. 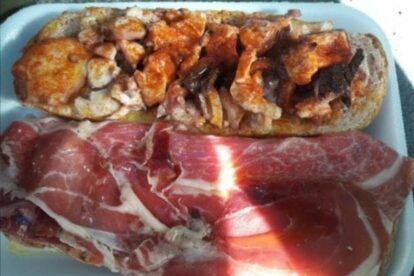 El Capricho Extremeno is special because it is meant to take away instead of sitting down inside and eating. The menu is divided into meat, fish, vegetarian and vegan. El Capricho Extremeno makes so many different options including tostadas with chicken and pepper, ham and cheese, octopus and red pepper (the best! ), shrimp with garlic, cheeses with nuts, among others. El Capricho Extremeno makes their own sangria which I believe is some of the best in Madrid. They add a little bit of cinnamon which gives it a great tasty kick. The shop is only open on Saturday and Sundays so you must plan accordingly. El Capricho Extremeno is always busy and has a line down the block but the wait is usually quick and painless. Upon entering take a look at the menu and be ready to order as the staff wants to make the process quick and efficient. The tostadas are cheap and huge (ranging from 2-4€). After one I always feel full and ready to walk around the busy La Latina neighborhood. After purchasing your tostada take it down the block to one of the many plazas or parks, sit down, and enjoy! If you go on Sunday you will also be able to enjoy the El Rastro market which takes place all around El Capricho Extremeno.